Moqueca is a vibrant dish of colour and seafood, with a heady influence from Brazil’s north-eastern Brazilian-African food. This Brazilian fish stew Moqueca is a taste of the tropics. With fresh fish, lime juice, hot bell chilli pepper and coconut milk this dish is unsurprisingly hugely popular and on most of the menus in Bahia. 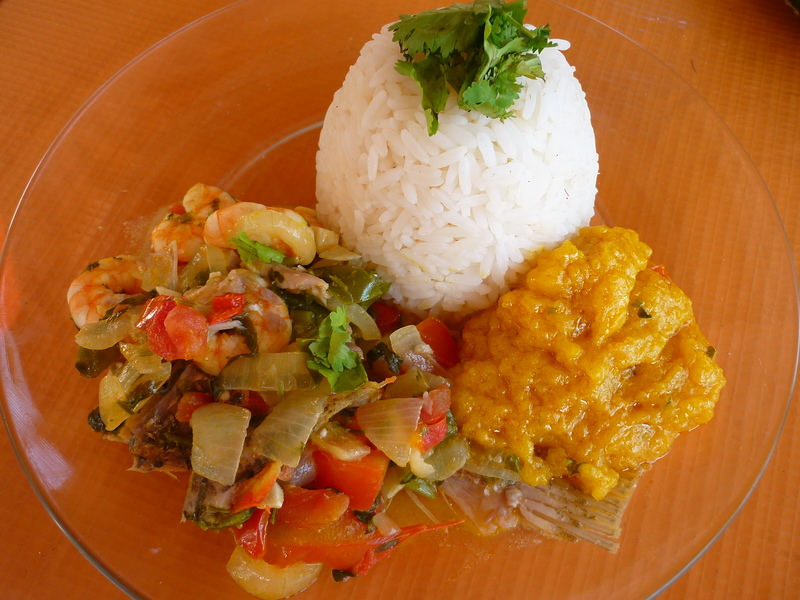 Moqueca is massively influenced by the Caribbean and African population that live in Bahia. The colours are as vivid as the locals dress and has a taste to match. The following serves 4 people. How: Peel shrimp and wash. Wash fish and cut into very large pieces (a 20cm fish would be cut into 3 for example). Finely chop 2 tomatoes, 2 onions, both chillis and corriander. Mix all together add the salt and leave to mix the flavours. Cut 1 tomato and 1 onion into slices. In a large (30cm diameter or as close as possible) pan add approx 50ml palm oil. Place fish in the bottom and add a third of the coconut milk. Add a layer using the slices of 1 tomato and 1 onion, plus another third of the coconut milk. Add a layer of all the prawns, chopped tomato, onion and the final third of coconut milk. Add another 100ml palm oil. The layers do not need to be exact, but the chilli, tomato and onion mixture should be seen throughout the Moqueca stew. Cook this for 20 minutes and add the lime juice when everything is cooked. In the meantime boil a medium sized pan almost to the top with water with a table spoon of salt. Wash the rice. When the water is boiling add the rice. Stir regularly while making the fish sauce. 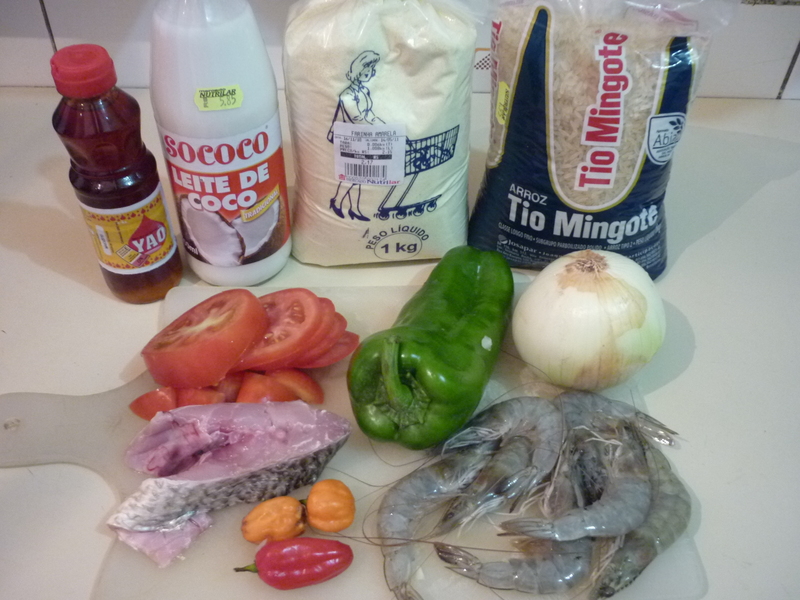 To do this add the remaining palm oil to a seperate, small pan and when it is hot add all the manioc flour. Stir until mixed well and then slowly add a ladel or large spoon of the liquid from the fish pot, while constantly stirring. Cook this until the liquid has absorbed and continue adding more liquid until the flour makes a very thick sauce (it should almost stick to a spoon when held upside down!) Now the rice should be cooked (around 10 minutes). Drain and serve with a large spoonful of the thick sauce and a generous helping of fish stew, including all the different ingredients of course! I’m not a huge fan of fish, but I love shrimp and would love to try this. Thanks for sharing on Twitter!